Inanimate Objects » How can I paint those tiny little details like eyes? How can I paint those tiny little details like eyes? 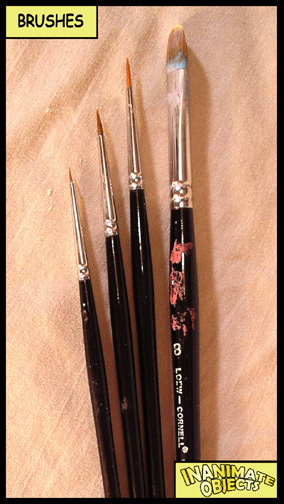 First, make sure you have some tiny, clean brushes that come to a good point. Use only a small dab of paint on the brush. Beyond that, it takes practice, a steady hand, and luck. I often paint an eye poorly, then cover over with a new base coat, and try a second time. Also, for you right-handed folks, the right side of the face is usually more difficult to paint. (And vice-versa.) Don’t forget, to really make your figure’s eyes “pop,” paint them ever so slightly cross-eyed. (Unless you’re painting a “realistic” figure.) That will make the eyes appear focused. Plus, adding a tiny white dot as a highlight helps, too.